"Clésinger's Woman Bitten by a Snake, a succes de scandale . . . ensured its creator's notoriety at the Salon of 1847. The scandal surrounding the work was orchestrated by Theophile Gautier, who spread a rumour that the cast for the statue had been taken from life. The model was Apollonie Sabatier, called 'camp-follower of the fauns' by the Goncourt brothers, but by Baudelaire 'the beautiful, the good, darling', 'a guardian angel, muse, Madonna' and 'girl who laughs too much'. This notorious work exerted a lasting influence. Sculptors began making the female body more curvaceous and languishing, but omitted the cellulite rippling above Mme Sabatier's thighs that had lent credence to the live-casting rumour. 'A daguerreotype in sculpture', wrote Delacroix, in his journal for 7 May 1847. However, the tide of realism was arrested by subsequent titles for nudes. 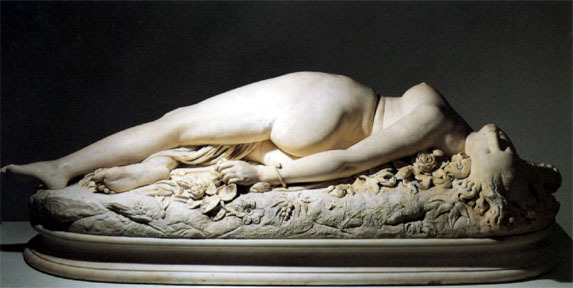 They were called Sleeping Hebe (Carrier-Belleuse) Eve after the Fall (Delaplanche) and Young Tarentine (Schoenewerk). Mathurin Moreau's Bacchante continued this series late into the century." — Pingeot, Musée d'Orsay, p. 45. 1. Do you think this sculpture scandalized people chiefly because they thought the artist cheated by taking a lifecast of the model (and thus avoiding part of the work — someone still had to carve it out of the marble)? Or was it statue's pose that bothered some in the audience. How could the non-mythological title have contribibuted to the scandal? 2. How was (in Pingeot's words) "the tide of realism . . . arrested by subsequent titles"? What effect, in other words, does adding a title have to a visual object? Pingeot, Anne. The Musée d'Orsay: Sculpture. London: Scala, 1998. Pp. 45, 52.